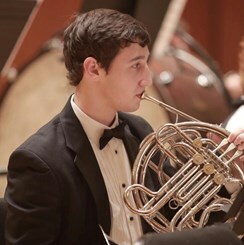 My name is Sean Turner and my primary instrument is French horn. I started playing this bizarre looking instrument when I was in the 4th grade and my love for it has yet to diminish. By my senior year of high school I was principal horn in prestigious groups such as Atlanta Symphony Youth Orchestra and Atlanta Youth Wind Symphony, as well as a 5 year All-State member. I then took my studies to the New England Conservatory of Music where I studied French horn for a year, but decided to take a gap year so I can explore other areas of fine arts - such as theatre! If you have any questions on brass instruments, especially French Horn, then feel free to ask me and I’d love to help you find the instrument that works for you!